Haji, one of the first children admitted to the Children's Village almost 20 years ago, successfully completed his teaching studies at the end of last year. So good that he could have gone on with the master right away. However, he has decided to first gain experience in practical work and to further his education during the school holidays. On the basis of the report of the Südwestpresse on 23.02.2019 with the title "Spendenaktion Ulmer Ärzte operieren Jugendlichen Joshua aus Kenia" the broadcasting station SWR4 region Ulm became aware of Projekt Schwarz-Weiß e.V. Marcel Dürr was invited as a guest to the studio for an interview. Harald Gäckle (Eye Laser Center Neu-Ulm) composed a new song including text for Nice View. 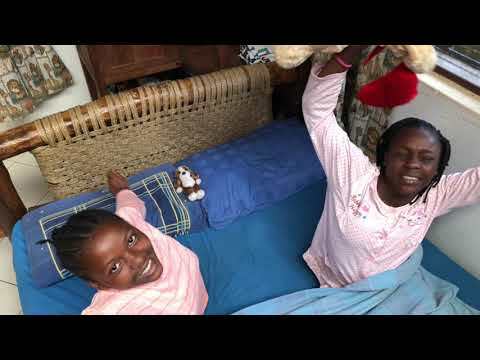 In the summer of 2019, Mr. Gäckle and his team would like to sing this song "In My Heart" together with the children in Kenya and make a music video out of it. Here is the song with impressions from the Nice View projects in Msambweni on the south coast of Kenya. The text was sung by Cinthia Koeksal and the song was accompanied by the guitar by Miguel Estrada. February 2019: Joshua gets a bed in a German clinic – please help! The management of the University and Rehabilitation Clinic Ulm (RKU) delighted us with the good news that Joshua can be operated in the RKU and receive a 3-week inpatient rehabilitation treatment 4 weeks after the surgery. 50% of the surgery and rehabilitation costs will be borne by the clinic. ASANTE SANA !!! Since mid-January, Fredrick, Mary, Sarah and Deborah are attending secondary schools after the successful completion of primary school at the end of last year. today we contact you on behalf of Joshua. Our Joshua complains already since a while about pain in his left hip. It appears now that he suffers from an epiphysiolysis of the head of femur, also named juvenile osteochondrosis of head of femur.